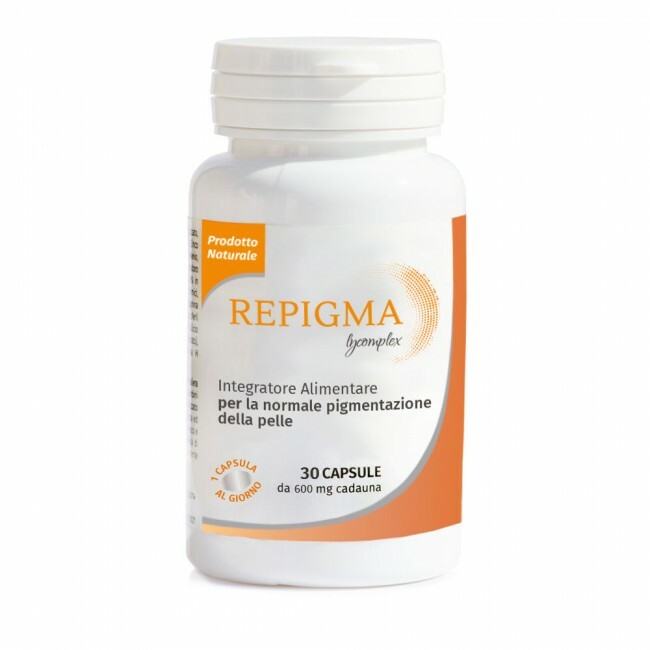 REPIGMA LYCOMPLEX is a health supplement with L-Phenylalanine, PABA (Para-Aminobenzoic Acid), Coenzyme Q10 together with Vitamin C ed E, group B Vitamins , Copper and Lycopene PSCto help stimulate an even pigmentation not only of the skin, but also of the hair. Particularly effective to rebalance the cutaneous pigmentation, such as in the case of Vitiligo. Licopene PSC with precious antioxidant action aimed to protect melanocytes (the cells which contain melanin) from the damaging action of free radicals. One capsule a day with full stomach. 30 x 600mg capsules in pillbox. REPIGMA LYCOMPLEX is a health supplement with L-Phenylalanine, PABA (Para-Aminobenzoic Acid), Coenzyme Q-10 together with Vitamin C & E, Group B Vitamins, Copper and Lycopene PSC, to help stimulate an even pigmentation not only of the skin, but also of the hair. Particularly effective to rebalance the cutaneous pigmentation, such as in the case of Vitiligo. Vitiligo is a skin disorder characterized by reduced or total absence of melanin in some parts of the cutaneous tissue, caused by an abnormal behaviour of the immune cells which attack the melanocytes, altering their ability to produce melanin. L-Phenylalanine, essential amino acid contained in most animal and vegetable proteins and which must be assumed through diet because our organism is unable to synthesize it. Its role is essential as precursor (helps the synthesis) of Tyrosine and Melanin, the latter responsible of the coloration of skin and hair. Over the years, several clinical studies have demonstrated that L-Phenylalanine can help the treatment of Vitiligo, and particularly that up to 100mg/kg/die combined with UVA sun exposure, has improved the Vitiligo condition in 200 patients. PABA (Para-Aminobenzoic Acid), commonly known as vitamin B10 due to its important role in the synthesis of folic acid. PABA fosters the synthesis of melanin from hydroxyPhenylalanine, and its deficiency can cause vitiligo, gray hair, scleroderma, itch, psoriasis. Aside from significantly improving the esthetics of the depigmented skin, it also protects it at cellular membrane level, helping to rebalance the pigmentation. Scientific Studies have demonstrated that PABA supplementation has a visible anti-grey effect, that is it counteracts the loss of pigmentation in the hair. Coenzyme Q10, essential coenzyme necessary for the cellular respiration and regeneration, improves the immune defences and has a pronounced antioxidant effect. Group B Vitamins, specific nutrients for the health of the skin. Their deficiency leads to the characteristic white spots on the nails. Vitamin B6 in particular helps the synthesis of Cysteine, constituent of Keratin and fundamental to the process of cellular regeneration of the skin. Vitamin C & E, essential thanks to their antioxidant action. Vitamin C also contributes to the normal formation of collagen and maintains the functionality of the keratin strati. Copper, essential trace element which contributes to the normal pigmentation of skin and hair (involved in the production of melanin), is also antioxidant, supports the immune system and it’s involved in the production of collagen and elastin. Lycopene PSC, a nutrient with invaluable antioxidant action which helps the protection of melanocytes (cells which contain melanin) against free radicals, dangerous for the health of the skin. Lycopene from Licofarma (different from commercial natural lycopene which might contain noxious substances residuals) is Organic Certified and highly bioavailable. The specific composition of Repigma Lycomplex is useful in the treatment of grey hair, the progressive loss of color in the hair. HOW TO USE: one capsule per day with full stomach. ADVISORY NOTICE: The product is intended as a supplement to a varied and balanced diet and a healthy lifestyle. Store in a cool and dry area and away from heat. The expiry date refers to a product stored correctly in intact packaging. Do not exceed the recommended daily intake. Keep away from the reach of children younger than 3. Not recommended for women of childbearing potential and prepuberal men and women. PACKAGING: 30 x 600mg capsules in pillbox. Camacho F, Mazuecos J. Treatment of vitiligo with oral and topical phenylalanine: 6 years of experience. Arch Dermatol. 1999; 135:216-217. Kuiters GR, Hup JM, Siddiqui AH, Cormane RH,. Oral phenylalanine loading and sunlight as sourceof UVA irradiation in vitiligo on Carribean island of Curacao. J. Trop Med Hyg. 1986; 89:149-155. Schulpis CH, Antoniou C, Michas T, Starigos J. Phenulalanine plus ultraviolet light: a preliminary report of a promising treatmentfor childhood vitiligo. Pediatr Dermatol. 1989; 6:332-335. Siddiqui AH, Stolk LM, Bhaggoe R, et al. 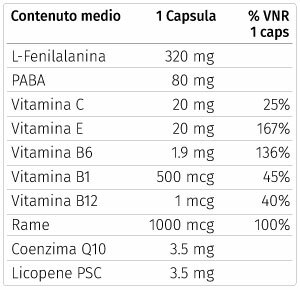 L-phenylalanine and UVA irradiationin the treatment of vitiligo. Dermatology. 1984; 188:215-218. Hughes CG.Oral PABA and vitiligo. J Am Acad Dermatol. 1983 Nov;9(5):770.